The Genesis Center | Got Headaches? Permanent Migraine / Headache Relief !! For 16 years I have been helping patients resolve acute and chronic pain forever ! Everyone has pain somewhere in their body but the most devastating pain comes from my headache/migraine patients. Over the years, as I have worked with this pain, I have truly stumbled upon a permanent cure. First of all, Headaches either come from outside or from inside the body. 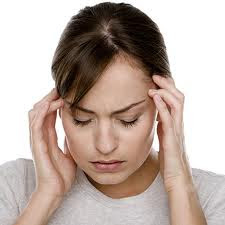 Food allergies, hormonal imbalances and toxicity can definitely cause head pain. However, I find that over 90% of headaches comes from muscle/structural imbalances that arise from trigger points and muscle spans in the neck and shoulders. 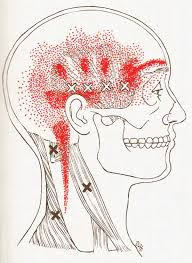 These trigger points , when in spasm, send pain referrals into the head, face, jaw and sinuses. It only takes me a few minutes or less to determine if your pain comes from muscular trigger point referrals. A young mother of 3 children was having a constant migraine in which she was unable to care for her family. She had seen multiple neurologist and she was on 3 horrible medications that were ruining her existence. I saw her once a week for 1 month and by the end of the month she was off of her medications. I saw her a few random times after this. I showed her and her spouse how to help resolve the headache when it tried to pop up and now years later, I see her a few times a year. A high school senior had been having chronic headaches/migraines for years. She is also a professional tennis player ranked in the top 100. After seeing her for 1 treatment, now 6 weeks later she reports that she no longer has headaches. Suffer no more. Come on in and let us eliminate your pain!